MSG Viewer Tool easily opens MSG File along with its attachments, user can click on attachment tab of the software to view all images, document files related to it. It also previews details such as Subject, From, Size, Received Date etc. 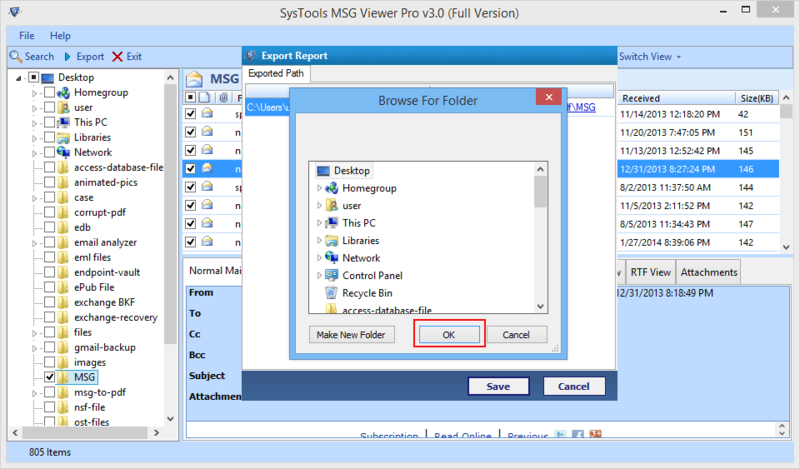 In MSG File Viewer freeware, user can select the different mode to view various details of MSG files. User can select even Hex View to see hex code information of the emails. Corresponding detail can be previewed in respective tabs. With the help of Message viewer Tool user can rearrange the emails according to different attributes of MSG File such as Subject, Sent date, File size, Received data etc. 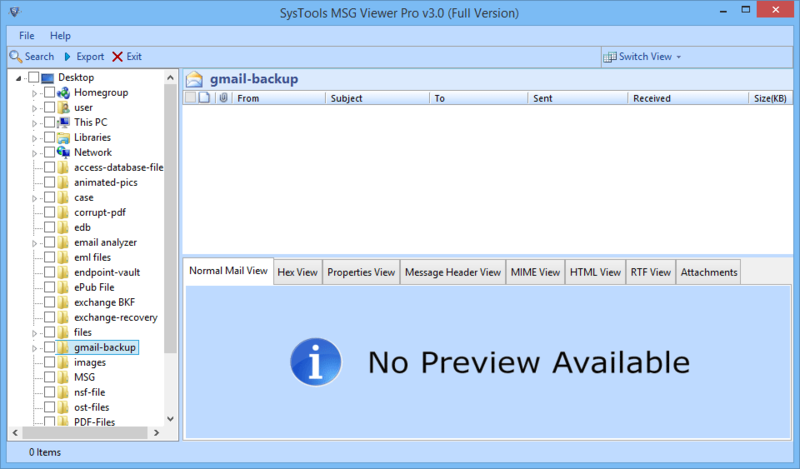 There is no need of Outlook Installation to run MSG File Viewer and user can open & view MSG File details easily. Software also support all Windows 10 & all below version. 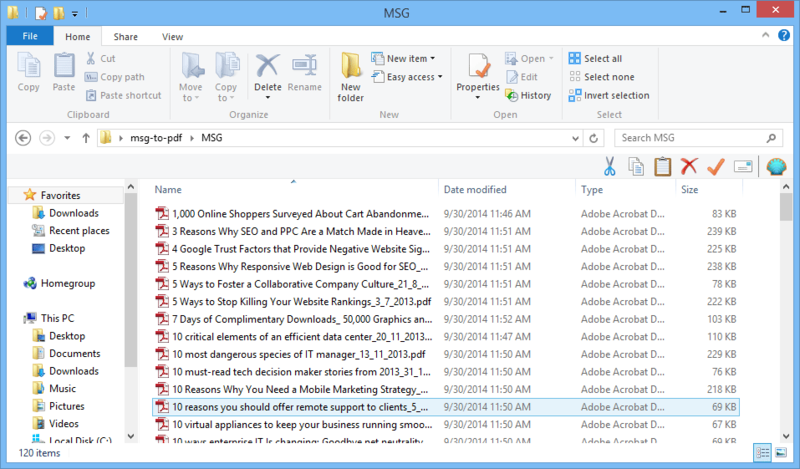 Msg File Reader can auto-locate folder stores the MSG File. This feature helps user to view details of msg file stored in the different location of the machine. 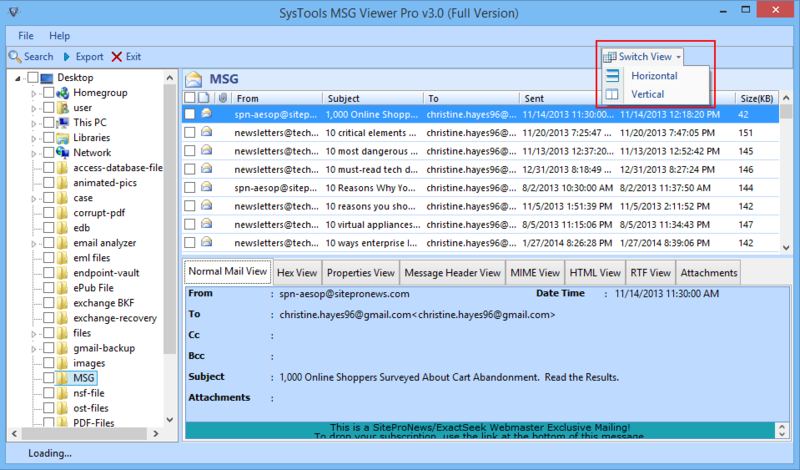 MSG File viewer generates an instant preview of emails and displays data in hierarchy order. Use text, keyword or phrase to search emails items in email and attachments stored in .msg file format. With Search filter option of MSG File Opener, user can also perform an accurate search to find the specific file. An MSG File acts as message format used in to save emails in Outlook and Exchange and different emails clients to save single mail file. Since Email files stores different field data such as email address, subject, sender and recipient and body of the message. Sometimes a user needs to view information of the MSG Files when Outlook application is not available or need to convert them into other file formats or need to convert attachment related to the emails. The Message viewer software designed to help naive and expert user to search information within Orphan MSG File and export the desired mail data to portable document format. For the deep analysis of MSG Files, a user can open the MSG file in different modes, such as Hexadecimal format, and view the attachments details in MIME format. Run Free MSG Viewer Software within Windows System. Now Navigate to MSG file from the left navigation pane of the software. View Emails details in different views such as Normal View, Hex View, Properties View, Html View. 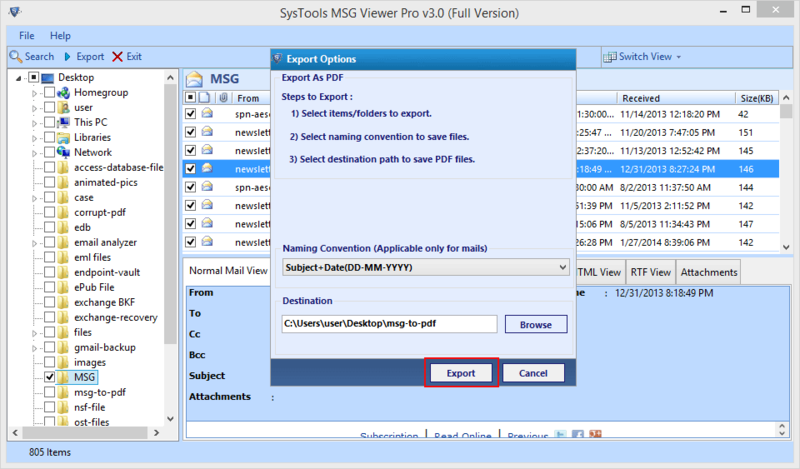 To export MSG file to PDF format, select the MSG File files and after selecting emails, Right click on it to Export option. User can also select Export option after selecting emails from Navigation bar. Select the different option of Naming Convention to set name on PDF File accordingly. 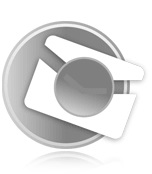 Browse location to store PDF files within system. After selecting Destination Path, Click on Export option. 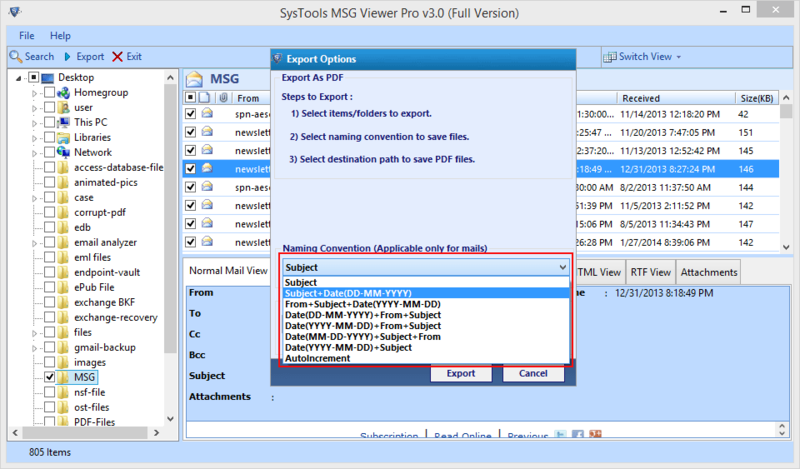 The MSG Viewer Software shows you Progress Status of MSG to PDF Conversion. 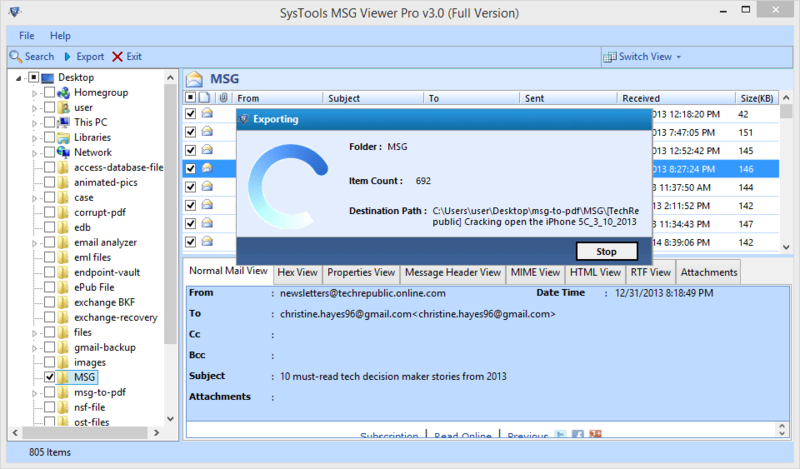 MSG Viewer displays a message "Export Process completed successfully", Click OK .
A Report is genrated of the conversion process, To store in CSV format, select CSV Button. Select the Destination Path to store CSV report. Click OK to the Save report. Even user can create a New folder to store PDF files. Now Navigate & Open it to view details of emails in PDF Format. MSG Viewer Tool- Replies All Doubts & Queries! 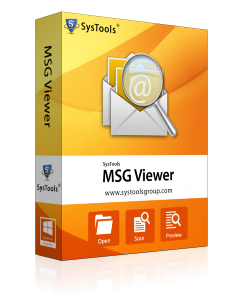 Is the MSG Viewer is a Freeware software? 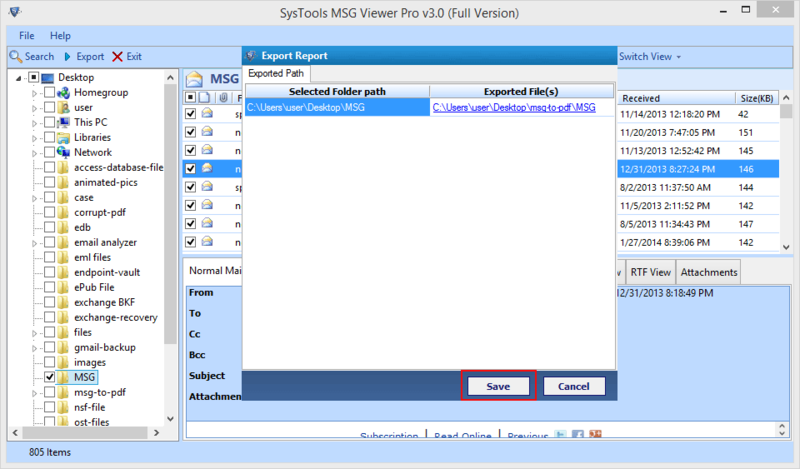 Yes, It is Freeware software to open and read MSG files, view all details related to emails but to export them in PDF format, user can go for Pro version of MSG Viewer. Is there any limitation on exporting msg file into PDF format using Pro version? No, there is no such limitation on converting MSG into PDF file format. Can I save emails attachment with the help of MSG Viewer Program? 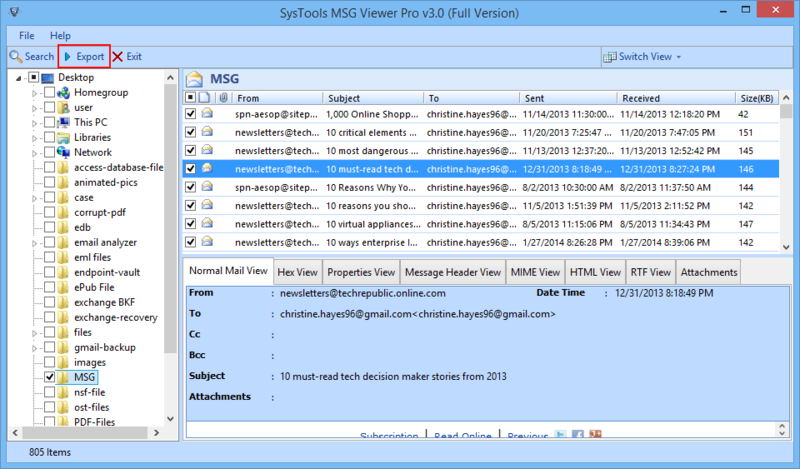 With the help of MSG Viewer freeware, user can only preview the details of emails along with attachments. To save into PDF format, user has upgrade software to its Pro version. Now I can view MSG files details in PDF format and store them on the local system without Outlook Environment. 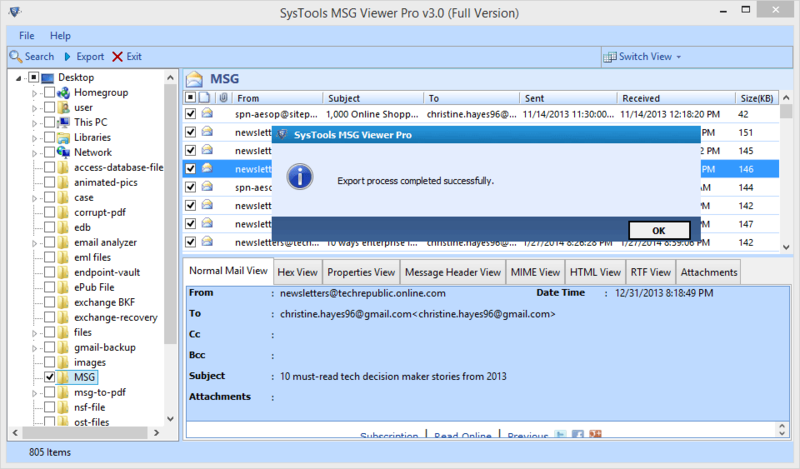 Good decision to upgrade the free version to Pro Version of MSG Viewer. Great tool to search specific details stored in hundreds of MSG mail files of Outlook. MSG Viewer helps me a lot to find and export them into a printable format.